They used to rent movies at the grocery store, you know. In those days, the small town of under 7,000 where I grew up – officially a “village” by whatever standards there are – was actually able to support three separate video rental places. That sounds unbelievable today in a world where you can’t keep a Blockbuster in business, but it’s true. One just had videos, one also developed photos, and the third was a section of a Sentry Foods grocery store. 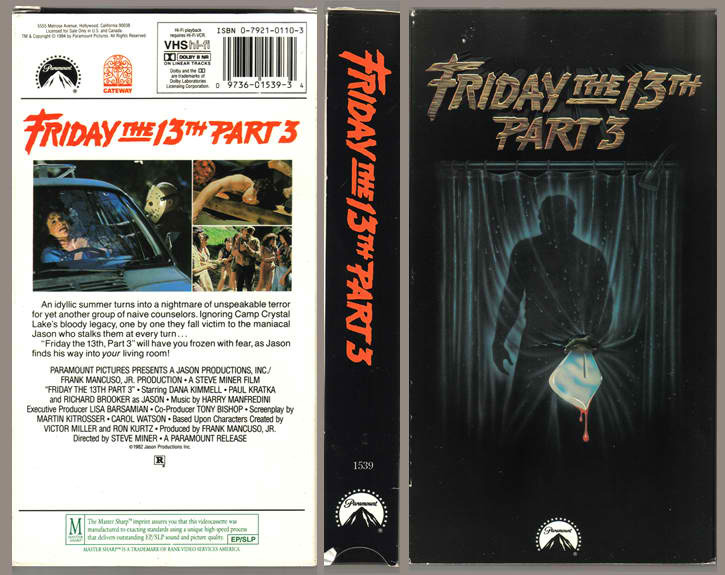 I can’t share a “first time I saw Friday the 13th” memory with you because that memory doesn’t exist – it feels as though I had always known about them. I guess the first place I must have seen one is on one of the local independent stations: WVTV-18 out of Milwaukee used to show heavily cleaned-up versions late at night sometimes. (I seem to remember Part VI: Jason Lives! getting a lot of play because it was one of the least bloody already, similar to how Superman IV: The Quest for Peace was their go-to Superman movie by virtue of being the shortest.) And through the Sentry rentals, I must’ve seen all eight of the original Paramount movies by the time I was twelve. I asked my mom about this recently – whether she ever felt weird having to go up to the rental window to check out some pretty notoriously violent movies for her son in the Batman Returns T-shirt* and the shorts and the white tube socks pulled all the way up. Whenever I wonder what exactly drew me to the movies, I think about that. 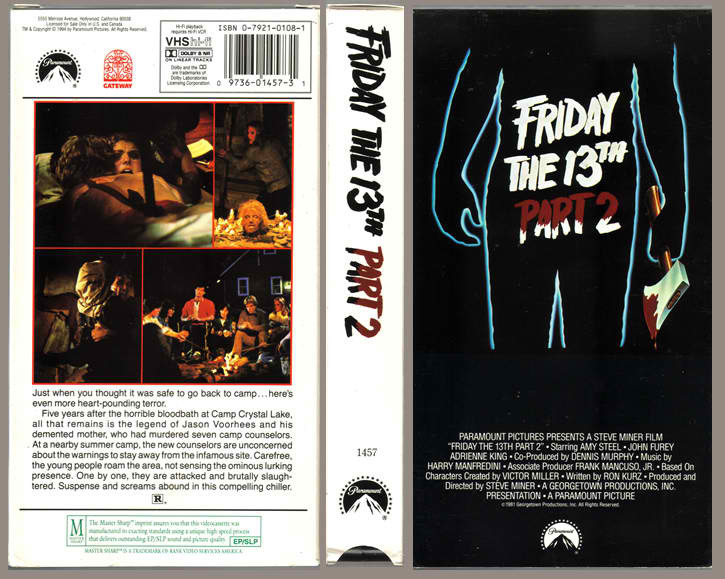 I never did think they were really all that scary, even then – you got a good jump, and I think the bit in Part 2 where Jason jumps out of bed is a genuinely terrifying scene, but it was nothing to have very serious nightmares over. Was part of the attraction that I could “handle it”? That Jason was something I was supposed to be scared of, but wasn’t? That’s a pretty big triumph to a little kid, isn’t it? Something to be proud of: simply to not be afraid. …or maybe it was always just the box art. People will tell you these are not very good movies. I have to admit that most criticisms leveled against the series are to some degree true. 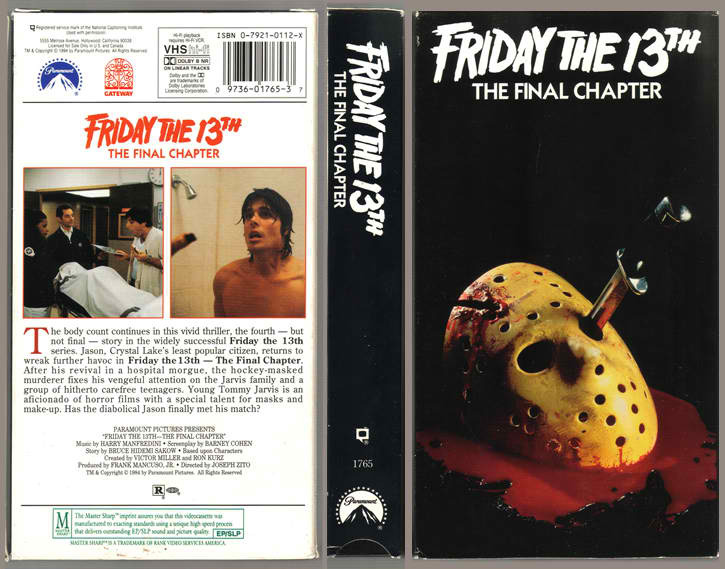 They’re formulaic, they’re shallow, they’re cheap, the Jason “mythology” doesn’t make any sense at all, the cast is usually pretty weak (although Crispin Glover does some honest-to-God acting in The Final Chapter; his idiosyncratic performance makes him the most oddly real character in the series). These movies really can’t hold a candle to the original Halloween on a pure filmmaking level, and yet I keep coming back to them for the atmosphere. The grainy film stock on the early movies creates a thick, inky blackness in the nighttime scenes that really captures what the woods are like in the dark. Harry Manfredini’s scratchy strings that kick in whenever somebody has to run through the woods is pretty great, too; Add to that the signature “breathing” motif – ch-ch-ch-ch, ha-ha-ha-ha (I know it’s supposed to be ki-ki-ki, ma-ma-ma, but I still hear chs and has). Bad films, perhaps, but always a nice experience. And part of that experience was going to the video store and staring at those wonderfully lurid boxes, trying to decide which one to get. These boxes don’t pretend you’re going to make your selection off the plot or the actors, or anything else. It’s all about the iconography — the shape of the killer; the thick, violently crude letters of the logo; and, eventually, that hockey mask. If you read my post on the dust jacket of Stephen King’s It, it should come as no surprise that I’d have a fondness for these tawdry, tacky beasts. Let’s go down to the Sentry and pick one out together, shall we? The best cover in the series, it really is. It’s the smallness of the characters that does it: their isolation is emphasized by the size of the forest around them…and the whole of the forest itself is contained the silhouette of the killer. I think it really sums up with that movie and the series are really about, or at least what I think they’re supposed to be about, after you boil it all down — it is scary to be in the woods at night. And once again I have to mention the wonderfulness of the logo — like a finger dripped in white paint and slashed onto the box. Appropriately, it’s as crude as the movie itself. Each movie comes with anywhere from one to four stills from the film on the back of the box. Some rather odd choices here — two daylight scenes, for one thing. The one with the arrow has some implied peril, although in the movie it’s actually just one of the other kids playing a prank. So’s the kid pretending to drown, actually — odd that this movie is advertised with its fakeouts. I’m also amused by the timidity of the last sentence of the back-cover copy. “This film is widely acclaimed for its horrifying and creative murder sequences.” No blood-gargling hyperbole here, just some polite bragging. “A-hem.” It’s the way you’d phrase it if you were putting it on your resume. Part 2 repeats the silhouette motif but goes minimalist with it. I think it works, if only because it puts that terrific logo front and center. If the front cover is a bit underwhelming, it makes up for it by actually putting some scary shots on the back cover to sell this thing. 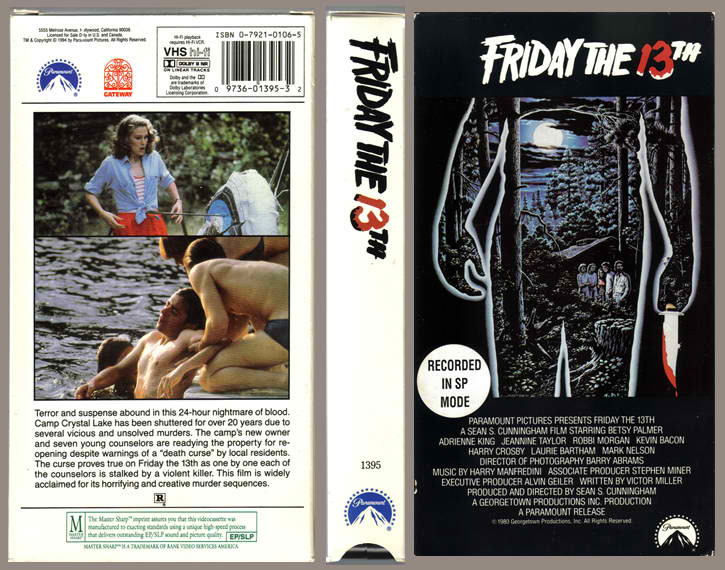 You get a pretty graphic impaling of a dude’s back, the rotting horribleness of Jason’s mother’s head, a nice spooky around-the-campfire picture, and a shot of bag-headed Jason, which I remember thinking was dumb as a kid but seems seriously eerie to me now; perhaps because we’ve become so inured to Jason-as-horror-icon, a man with a potato sack on his head doesn’t register as Jason, and so he has a power independent of the rest of the series. Now see, this one is the weakest image of the series. The silhouette motif returns, but less distinct. The knife is coming out at you in forced perspective to drive home that this is supposed to be the 3D one, but the whole thing is lacking in power; the image seems a little smaller than it needs to be, and it cribs its iconography from Psycho. Really, this image could be from any 80s VHS horror movie. They’ve also redrawn the logo in a way that’s a little more designed, and making it look like it’s carved out of wood is an odd choice. Hey, but the hockey mask appears on the back at least! 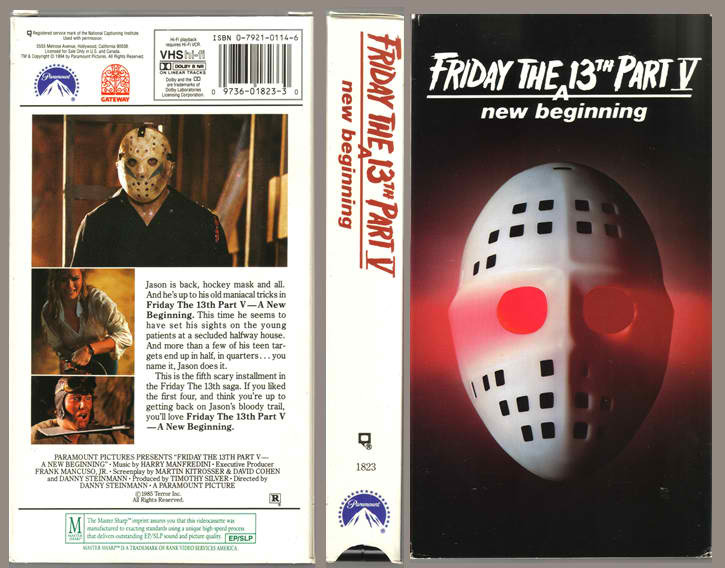 The hockey mask doesn’t even appear in the series until halfway through Part 3, but by the time this movie came out, it had become iconic enough to replace the silhouette motif – and what a debut, hey? I think this is the cover for most fans of the series. And really, there isn’t much to it. It’s a still life; the horror equivalent of a flower in a vase, and a crudely executed one at that. I mean, you could stage this; you could get a dirty hockey mask and a knife and put some red food coloring in some corn syrup and come up with this prosaic little snapshot; it’s not particularly artful. And yet, it’s precisely the sort of thing that grabs a nine-year-old boy’s attention and says, “This is the one you wanna see!” When they made a (terrible) Friday the 13th game for the NES, this image starts off the game for good reason. It introduces the iconography and plays with it – the knife through the eye is a promise. Really damned weird choices for the back cover stills, though. Weasel-y Morgue Attendant signing for Jason’s body. All right, there’s a body there, but it’s covered up in a sheet, and Hell’s bells, that guy is eating a doughnut; where is the terror in that? The guy in the right photo looks suitably frightened, but it’s still an unusual frame to select to be representative of your movie. I’m almost certain my video store had a different version of this box, with the left photo replaced with a still of Tommy in his alien-head mask…which is just as weird and only a marginal improvement. Huh. I don’t know man, what was the decision-making process on this one? The art guy was like “This is the series with the hockey mask, isn’t it? Any hockey mask’ll probably do; I think my son Kevin’s got one in the garage.” I’m sure it caused some confusion. It looks like a knockoff, even to a kid, but it isn’t. Possible controversial opinion: This is my least favorite movie of the original series, but I’m sure I rented this a bunch of times based on the strength of that cover alone. The hockey mask is a gimmick, but it’s used to magnificent effect — a shadow bursting with blue, stabbing light. 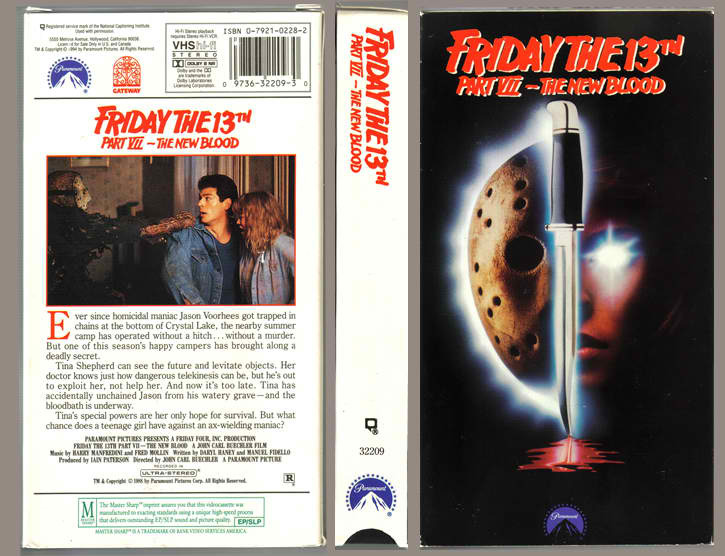 This image and this movie are the slasher movie turned up to 11 and offering no apologies — scratchy violins replaced with late-80s wailing electric guitar, the inky blackness of the first movies replaced with a forest filled with floodlights. 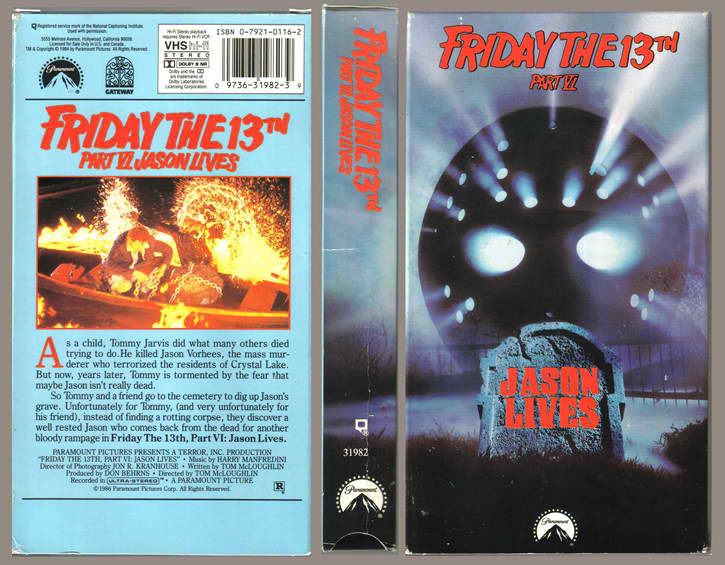 Big red letters: JASON LIVES! This is popcorn, this is Jason for Jason’s sake. I mean, look at that back cover photo! A flaming Jason leaping out of the water with what looks like fireworks coming out of his hands! This is awesomesauce from a time where such things were not tempered with irony. This one, on the other hand, is like a kind of weird late-80s album cover by some new wave synth-pop diva. 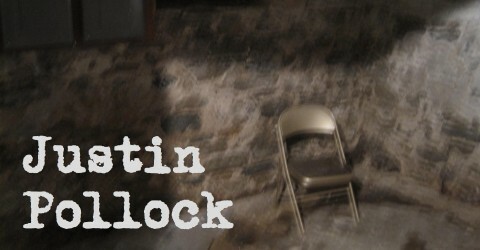 Or indeed, some kind of Stephen King dustjacket! The “split” face always suggested more to me than was actually contained in the movie – that there was something connecting Tina, the psychic/telekinetic protagonist of the film, and Jason — that it would be her face beneath the mask, or perhaps his mask beneath her face. Neither is the case, and it’s not even clear who or what the title refers to, if anything or anyone, but I still like this cover for being lurid and letting it all hang out, for being so sincere about itself. 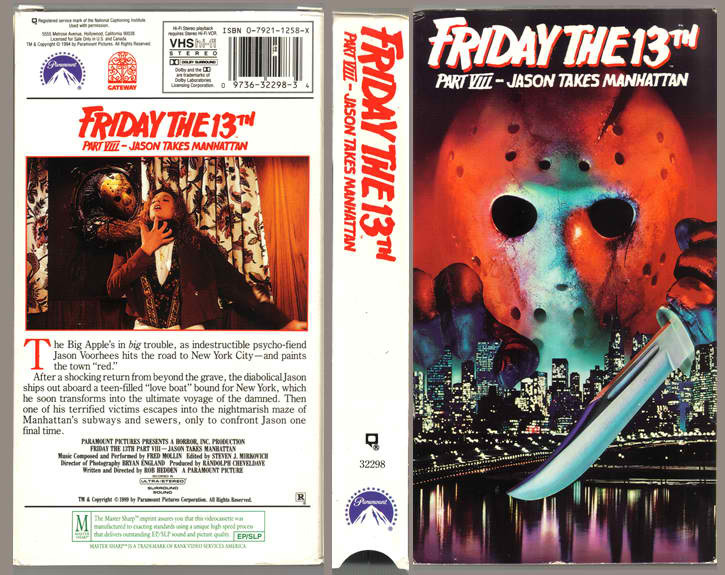 The back cover, while perhaps not the most exciting possible shot, treats us to a shot of my favorite Jason design, the fully inhuman, partially rotting reanimated corpse. All right, now we’re at the point where we can debate whether irony is creeping in. Jason looming over the New York City skyline is an obvious, unimaginative image to go to. So is it a case of a designer using the first thing that pops into his head? Or has the designer presented us this image in the most direct way to get us to go “Ha ha, Jason in New York!” Is this the proto-Jason X in conception if not execution? Still, a large, unmanipulated shot of the mask does point out what’s so terrifying about the design – those black, hollow eyes staring out at you, right? And I have to give this back cover still the award for best in series – that’s a scary thing right there. That’s the promise of the series – some kind of messed up, inhuman thing coming out of nowhere to kill you. So what are you picking up from Sentry, then? * – Although actually, Batman Returns is a pretty intense movie for a kid as well, and that one had McDonald’s toys to go with it! ** – See, the triangles are in a different pattern, and they’re blue instead of red.